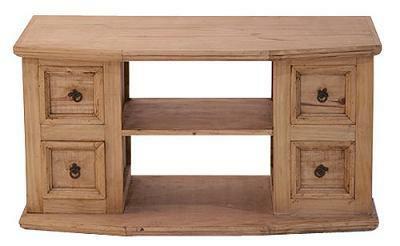 A basic, sturdy, compact 4 Drawer TV Stand for your Mexico living room. Solid, kiln-dried pine wood. Space for your television as well as a DVD player. Four small drawers with lovely iron pulls are ideal for storing the remote controls, cds, dvds and staying organized. If you want it to match your dark chocolate Mexico decor, you may of course order it in dark stain.